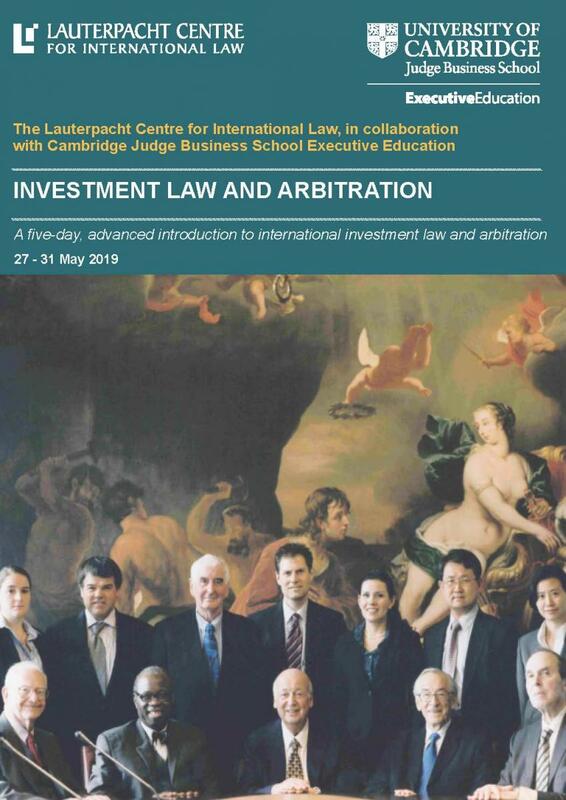 The course is a five-day advanced introduction to international investment law and arbitration run by the Lauterpacht Centre for International Law with Cambridge Judge Business School Executive Education. International investment law has become a major area of international dispute settlement. The law on international investments and arbitration has attracted much attention recently, and saw a number of important developments that will leave their mark in the years to come. Investment arbitration raises challenges distinct from those raised in other forms international dispute settlement, including complex questions of how to value assets and how to develop and position an arbitration practice in a highly competitive arbitration market. At the end of the five days, participants will be equipped with a unique background in the substantive, procedural and strategic aspects of bringing or defending an investment arbitration. This five-day programme provides an advanced introduction to international investment law in the context of public international law and practice focusing on recent developments. It offers the opportunity to learn from Cambridge law and business school academics, as well as leading practitioners drawn from major law firms and barristers’ chambers. It is designed both for junior practitioners who are developing a practice in international investment law and for more senior lawyers who wish to re-orient themselves to investment arbitration. Participants will receive a certificate of participation on successful completion of the course. Whether for lawyers in private practice, in government departments, or in-house counsel, a thorough understanding of the building blocks of international investment law and how it is embedded in general international law is becoming increasingly important. Lawyers in private practice who are developing a practice in international investment arbitration, and who seek to consolidate their knowledge of international investment law and general international law. In-house counsel or government lawyers working on investment arbitrations. Understand how to use fundamental building blocks of general international law (state responsibility and treaty interpretation) in investment arbitration. Learn about substantive and procedural aspects of investment arbitration from leading practitioners and academics at the University of Cambridge. Experience first-hand a unique, customised programme delivered jointly by the Lauterpacht Centre for International Law and Cambridge Judge Business School at the premises of one of the world’s best universities and a world-leading research centre in international law. Develop a thorough grounding in central substantive treatment standards (expropriation, non-discrimination and fair and equitable treatment), and procedural aspects of investment arbitration. Network, exchange and debate with leading academics and practitioners. Fees include all programme materials, daytime refreshments, five nights accommodation in the centre of Cambridge, some Cambridge-based activities, an opening dinner and a formal gala dinner in a historic Cambridge College. Participants are expected to attend the full programme. No scholarships or fee waivers are available for this course. To apply, please send a CV and a one-page statement of interest to Anita Rutherford, Centre Administrator, ar293@cam.ac.uk. Applications will be reviewed on a rolling basis. For any course queries, please contact Dr Michael Waibel, Academic Programme Director, mww27@cam.ac.uk. For any administration queries, please contact Anita Rutherford, Centre Administrator, ar293@cam.ac.uk.